There are good basic elements to Antti Tuomisto’s game. The Finn’s gap control is fine and he manages to reduce the attacking player’s space in the offensive zone. As a power play quarterback, Tuomisto looks for a simple and safe pass with no risk of turnover. His first shift of the game didn’t start well, though. Tuomisto lost control of the puck in the neutral zone, which almost led to an odd-man rush for USA. At the beginning, Tuomisto was a bit shaky with the puck. Tuomisto’s straight line speed is quite slow and he doesn’t gain a lot of momentum during his few first steps. His lateral movement is better but it requires anticipating the play. All things considered, he relies heavily on his positioning. The Finn uses his body well near the boards. He has a big body but there’s a plenty of room to fill out. On the downside, Tuomisto has a tendency to get himself off balance under the pressure. He compensates it by using his stick to cover passing and shooting lanes effectively. Tuomisto had a great game against Ilves even though his team lost 5-3. He played on Ässät’s top pair and was also used on their top PP and PK units. It seemed like he played every other shift, and it showed in his 27:03 of ice time which was easily the highest in the game. Tuomisto is a calming presence on the ice. He keeps his head up and reads plays really well. He doesn’t panic easily. He made crisp tape-to-tape passes and also did a great job carrying the puck up the ice himself when needed. He likes to join the rush, and he had one good scoring chance from one of those situations. He had an assist on two of his team’s three goals. When he was pressured in the offensive zone, he did a great job throwing the puck to open space to avoid turnovers and allow his teammates to get the puck. His shot was also looking great in this game. His one-timer is hard and pretty accurate, and his wrist shot found its way to the net quite frequently. He had 13 shots which was more than anyone else in the game had. Defensively, Tuomisto hits players to separate them from the puck but doesn’t go looking for big hits. He needs to improve his play in front of the net because sometimes he didn’t know what to do there. One thing he has definitely learnt already is cross-checking opposing forwards in front of the net because he was doing it a lot. Tuomisto needs to add more power to his skating but that will likely come when he adds some much-needed muscle to his thin frame. His agility looked good considering his size. He can make quick turns and stops even when he has the puck on his stick. It was a really feisty game because of some missed calls early on but Tuomisto kept his composure and didn’t waste energy on scrums happening after the whistle. A lot of players got too caught up on the feistiness but Tuomisto did a great job avoiding that. Tuomisto was playing on Ässät’s top defensive pairing in their 1-3 loss against JYP. He was featured on both special teams, quarterbacking the top power play unit from the point. Measured at 6’3”, Tuomisto is a tall two-way defenceman. His skating looked quite good going forward and backward, but his lateral movement was not great. Tuomisto was able to make up for his lack of mobility with his reach, but against quick opposing forwards it could end up being a problem. He showed good poise with the puck in his own end, regularly making solid breakout passes. Tuomisto did not look very comfortable with the puck in a few situations, but by keeping his play relatively simple, it was not a big problem. Tuomisto skated in an upright stance and seemed very engaged, always reading the play developing around him. He has a very powerful shot from the point, which he used multiple times on the power play. Defensively, Tuomisto missed a few assignments here and there but used his reach and size very well. He will be even more difficult to play against once he fills out his frame. Tuomisto played an impressive game being one of the best players for the Finnish team. He made constantly simple, right decisions and played a very stellar game in all aspects. The big-bodied defenceman skates well, and while his top speed isn’t top notch, it’s certainly enough to be effective in the own zone combined with his good reach. Tuomisto finished second in the tournament in assists with six in four games trailing only Jack Hughes. I usually refrain from comparing prospects to other players in these reports, but the resemblance of his playing style to Stars defenceman Esa Lindell is remarkable. I think he has the potential to be a minute-munching all-around defenceman in the NHL level. 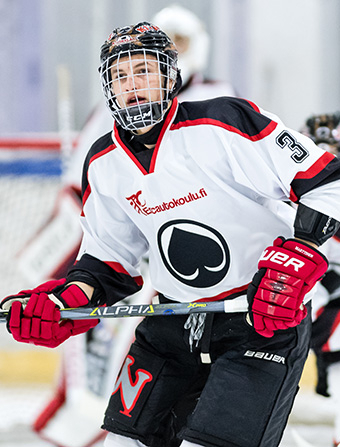 Tuomisto played on the second pair for Ässät U20. He was also used on the second power play unit, and he was frequently used on the PK as well. Tuomisto was very impressive in this game. He was probably double-shifted because he seemed to be on the ice all the time. He looked very calm and poised, and made smart decisions with the puck. He had his head up all the time looking for passing lanes but he also showed he’s capable of rushing the puck. Tuomisto’s skating looks effortless, and his top speed was good. Backwards skating looked great, and he showed he can easily switch from forward skating to backwards skating. For someone his size, his directional changes looked pretty good. His acceleration still needs some improvement. Did a great job exiting the defensive zone even when he was pressured. Tuomisto made some really nice pass interceptions but his defensive zone coverage needs some improvement. His long passes were a bit off, so that’s another area for improvement. Tuomisto played a big role today especially after the injury of Juuso Ketola. He played both in power play and penalty kill and recorded total of 28,5 minutes of ice time. He also got a primary assist to the first goal of Ässät when his shot was steered to the net. Tuomisto is a big defenceman with some interesting qualities. While his skating is not stellar, he certainly is not clumsy. While to me top speed and first steps could be bit better, he is pretty good at those for a player of his size. He is not the flashiest defender and he usually thinks defense first, but he has pretty good puck-handling skills, he gives crisp passes and he even carried the puck effectively during the game when necessary. He occasionally reacted too slowly at the own end and I would like to see more physicality from him, but he has talent to become modern two-way defenceman. Reading of play probably improves when he matures and he is already really effective with his checking game. He has a very long reach and his defending with the stick really stood out positively in this game. That part of his game combined with above average puck protection skills and ability to change the direction effortlessly makes him a player whose development is worthy of monitoring.